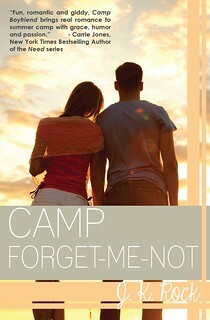 Today is my stop during the blog tour for Camp Forget-Me-Not, the third book in the Camp Boyfriend series by JK Rock! I interview the authors and there’s a tour wide giveaway! Playing it safe and fitting in may have rocketed Kayla West into the “In” crowd at Camp Juniper Point, but it’s left her lonely. The only person she’s ever been herself with was her former best friend, Nick, an outsider that pushed her to join the most popular girls cabin two years ago. Too bad being a Diva meant pressure to break up with Nick. Of course, Kayla had her reasons, but Nick can never know the real one. She always thought she’d forget him one day and move on. Until he returns to camp a super-hot Olympian snowboarder. Now, every girl wants him and Nick seems determined to show her what a mistake she made. Or at least, she thought that’s what he wanted. But when Nick starts sending her private notes–just like he used to–she wonders what kind of game he’s playing. Nick’s attention is making it tougher to stay in the background and play in safe, forcing Kayla to make a decision–stay on the sidelines and get overlooked? Or take a chance on trusting Nick and, maybe… herself. Hi Karen and Joanne! Welcome to Lola’s Reviews. I am so excited to have the chance to ask you some questions about your newest book Camp Forget Me Not! I haven’t had the chance to read it yet, but I am eagerly awaiting the arrival of my copy! First can you describe Camp Forget Me Not series in a few words? The Camp Boyfriend series is fun, romantic and heartfelt. We cared as much about the friendships and the summer camp experience as the romantic element. I think the combination of friendship and romance worked really well in this series! For readers new to this series, can you give us a few reasons why they might enjoy the Camp Boyfriend series? This is a great series for readers who like escapism with some substance! The stories draw you in for the fun setting and the immersion in the world. But I think you stay for the friendships, the life lessons, and the swoony parts! I agree every book had a message, but they are also great to escape to the camp setting! I can’t wait to read this book and return to Camp Juniper Point. Every book in the Camp Boyfriend series is narrated by a different main character, why did you make the decision to tell the story in this way? The friendships were so important to us that we wanted to see what made different characters tick. From Lauren’s point of view (heroine of Camp Boyfriend), Alex (heroine of Camp Payback) could be unpredictable and moody. But when we were in Alex’s head we saw the passion and fire she lived with—she can’t help her impulsiveness. Then, when we landed in Hannah’s point of view for a novella (Camp Christmas), it was fun to see why the classic “mean girl” behaved how she did. Sometimes we act out when we’re going through dark stuff. That doesn’t make us bad for life! We think seeing inside different characters’ heads helps readers have more empathy for different people and see things through new perspectives. I am a big fan of multiple point of veiws and I think it really helps seeing the different perspectives form different characters. The Camp Boyfriend series is set at Camp Juniper Point, what does camp mean to you and have you ever been to summer camp yourself? We have both been to summer camp! We loved it and that helped inspire us to write the series. Summer camp is a unique world with its own rules and shoe different brand of fun. Some of the storylines can only take place because the characters are “unplugged” which doesn’t happen as often in real life for teens. Summer camp connects people and experiences outside of technology and we thought some kids might find it cool to see how the impact that has on their lives. I wish I had the chance to go to summer camp, unfortunately here in the Netherlands summer camp isn’t really a thing. So I am happy I can experience camp through your books! You co-write this book with the two of you, how does that work writing a book with two authors? How is it different then writing a book solo? Writing a book together is more fun! You never get stuck because you have a built in brainstorming partner. We found the process easy and enjoyable, although sometimes it moves slower since you don’t always write when you’re most “fired up” as we each write a chapter and then pass the book back. However, sometimes that helps move things faster since it forces a consistent pace. Sounds like co-writing can be both fun and more challenging! And for the last question, can we expect to see more co-written books by you two in the future? We certainly hope so! We have a novella, Camp Crush, due out next month and we will be thrilled to share a favorite character’s story with readers. But after that, we are working on some adult romance books so we’ve got that to keep us busy. Look for our other works –Karen and Joanne — online! I already read most of Karen her solo books, but I still haven’t picked up any of Joanne her solo books :(. I hope I cna make time for that soon! Thanks for answering my questions! It’s always a pleasure talking to you! Writing partners Joanne and Karen Rock pen Young Adult books as a team in addition to solo careers as adult romance writers (learn more below). Married into the same big, boisterous clan, Joanne and Karen quickly bonded over a shared love of books. After a decade of re-plotting their favorite films during family parties, they decided to write a book of their own. They sold their first attempt to the Spencer Hill Contemporary imprint of Spencer Hill Press as the launch title. Writing a book definitely sounds fun! Good job, you two, on Camp Forget-Me-Not! They really make writing a book sound fun! My copy of Camp Forget-Me-Not just arrived, so I am planning on reading it soon! Thanks for following my blog Olivia! I hope you pick up this series, I really enjoy it so far! I have the first two and still haven’t had a chance to read them. I heard they are really good and honestly not sure what I am waiting for 🙂 Didn’t know they had a 3rd one! This is the last novel in the series, there will be one more novella. I am bit sad this is the last book :(. I read the first two books and loved them and can’t wait to dive into the third book! I love Joanne and Karen Rock. Great authors. They are great authors indeed!